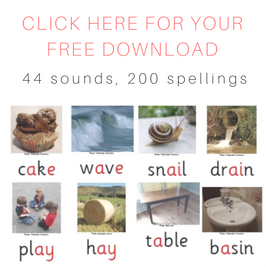 I've been looking around for extra materials to add to this site's Phonics Resources pages, so I thought I'd work through the ones on Wikipedia's List of Phonics Programs page. The first one on the list is Yes Phonics. So I went to the Yes Phonics website and found an orange box saying "Test Drive The Express Program For Free! 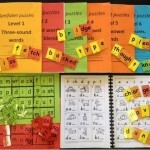 Start Teaching Phonics Today! Start now". "How good is that?" I thought. Two exclamation marks. I signed up straight away. 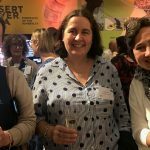 Immediately there was an email in my inbox, thanking me for signing up and promising me 14 days of exciting sample lessons, ready to use with my learner. The email says, "Start by watching this fun, engaging 26-minute video" to learn the basics of how to easily decode English. 26 minutes is nearly half an hour, which is quite long, but anyway it's school holidays and I had time, so I settled down to watch. 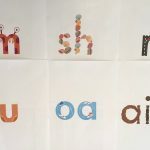 The video contains a brief introduction by the grandson of the person who invented Yes Phonics, and then consists of a long sequence of 72 spellings and their sounds, often giving additional information about the sounds, plus an example word, phrase, or sentence. A voice says the sound or sounds for each spelling, any additional explanation and the word/phrase/sentence. Really? What about "bayou", "caribou", "thou" and "you"? There is a great little website called "More Words" where you can search for words containing any spelling pattern. 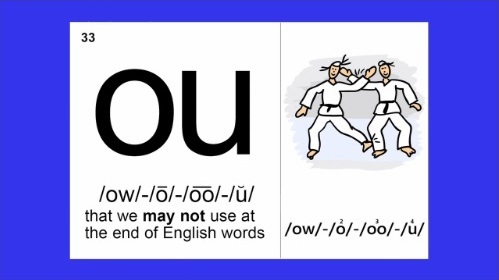 Click here for all 28 English words it says end in "ou". The stated goal of this video lesson is for the student to watch the whole 26-minute video and "sound out each of the phonograms presented". There isn't time for learners to sound out the spellings before the video voice starts, so I assume learners are meant to copy the voice. However a single instance of each spelling and its sounds is not likely to be enough for anyone to learn even one of them from this lesson. 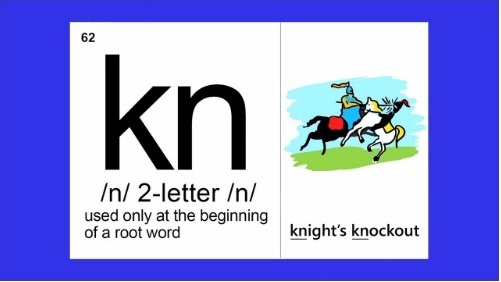 How many beginning readers/spellers even know what a root word is? 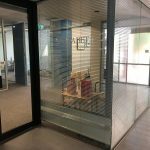 Do they need to know at this stage? How many can understand what is meant by "after a single vowel that says /a/-/e/-/i/-/o/-/u/". I know that my language-impaired learners struggle with sentences containing the conjunctions "before" and "after", so such a description isn't going to be much help to them. 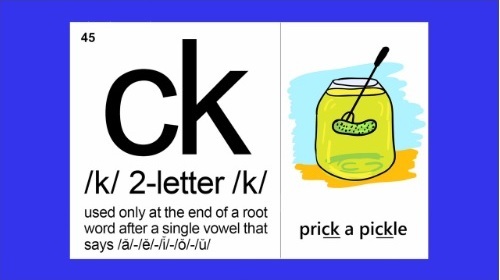 I also wonder why the example sentence is "prick a pickle", not something more likely to be interesting and relevant to young learners, like "duck says quack". But maybe in Missoula, Montana, they do a lot of pickle-pricking. "Beginning"? "Ending"? "But not"? "After the first"? "Except"? All in the same sentence? Forget it. Having sat through all 26 minutes of this video, I can tell you that the Yes Phonics people's idea of fun and engaging is not mine. As this is an American program, "leisure" is pronounced to rhyme with "seizure", which it doesn't in Australian or UK English. And if they don't count "air" as in "care", "fair" and "their" as one of what they say are the 45 (? what's the bonus sound?) sounds of English, what are they counting instead? Also,"glutei", "lei" and "nuclei". When talking about English spelling, it's best to never say never. The narrator's accent makes the word "root" sound like "rude", and he repeatedly says things like "used only at the end of a root word", so perhaps there has been some giggling which misled them to the conclusion that this video is fun and engaging for learners. 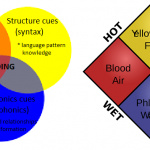 Anyway, Yes Phonics works from spellings to sounds, not from sounds to spellings, so it's not Synthetic Phonics. 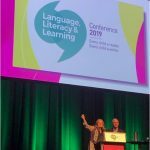 This video doesn't fill me with confidence that Yes Phonics presents information in a way that is effective and engaging for learners. So I don't plan to use or recommend it. 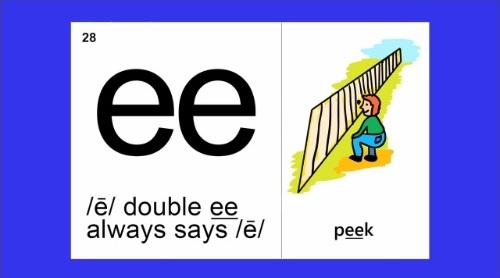 This entry was posted in phonics activities, reviews, teaching strategies, UK/US spellings on July 8, 2013 by alison. I know this is an old thread, and perhaps no one will see it, but I’ll comment just in case it can help someone. We used a similar program many years ago. The words “fiancee”, “matinee”, “melee”, “puree” and “toupee” are not English words. 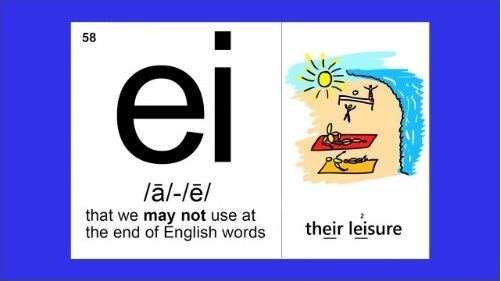 People mistakenly think that words adopted from other languages into English should follow English spelling rules. They don’t. 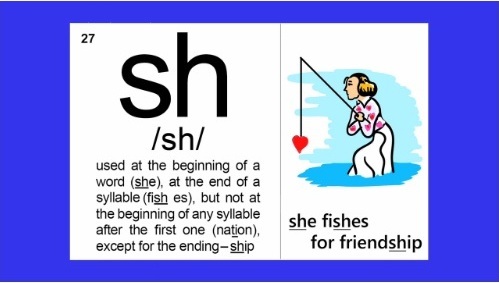 For example, we learned “English words do not end in i.” What about “ski?” The answer is, “ski is not an English word.” And so on.